Norwegian Cruise Line announced today that it will order a new ship for delivery in October 2015 that, at 163,000 gross tons and about 4,200 passengers, will be the line’s largest to date. The ship will be built by Germany’s Meyer Werft and is expected to cost around 700 million euros or $920 million U.S., Norwegian said. The line also has an option for a second ship, for delivery in spring 2017. The new vessel will be larger than the 4,000-passenger Norwegian’s Breakaway-class ships currently under construction at the Meyer Werft shipyard in Papenburg, Germany. Its biggest ship, the Norwegian Epic, is 155,873 gross tons and accommodates 4,100 passengers. Norwegian is calling the project “Breakaway Plus,” and it said the new ship will incorporate many of the design elements and innovations of the Breakaway and Getaway. 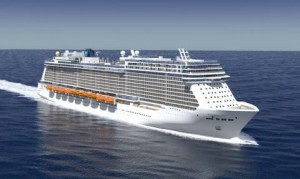 Norwegian Breakaway will enter service in April 2013 and Norwegian Getaway will enter service in February 2014.